Whispers in the Loggia: Gusta... Whoa: In Shock Pick, Chicago Aux to "Santone"
Gusta... Whoa: In Shock Pick, Chicago Aux to "Santone"
An auxiliary bishop of Chicago since 2003, Gustavo García-Siller has largely been a stealth figure on the wider scene, keeping a remarkably low profile while tending an 82-parish vicariate of the Windy City archdiocese, alongside at-large responsibility for the Hispanics soon to comprise a plurality of its 2.3 million Catholics. As soon as tomorrow morning, however, any semblance of quiet for the 53 year-old prelate is expected to reach a sudden, astonishing end. In Benedict XVI's second surprise nod in a row for a metropolitan see on these shores, two reliable sources indicate to Whispers that the pontiff is set to name García-Siller as archbishop of San Antonio, rocketing the Mexican-born cleric from relative obscurity to the chief pastorate of the 750,000 Catholics in the nation’s seventh-largest city. Through the day, reports of feverish preparations for an announcement have come from along the Riverwalk -- where, according to one op, the presumptive pick hasn't just landed, but already been spotted by the locals. Begun from early morning, multiple calls to the archdiocesan communication director, Deacon Pat Rodgers, went unreturned, likely due to a sudden relay race between meetings. 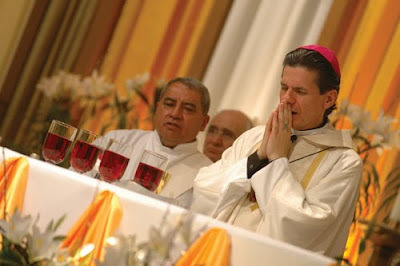 On tap to become the Stateside bench’s youngest metropolitan by nearly five years, García-Siller (pron: SEE-yer) would succeed José Gomez -- the last American archbishop named in his early 50s -- who, in these shores' Appointment of the Century, was tapped as coadjutor of Los Angeles in early April; now 58, Gomez will take the reins of the 5 million-member LA church -- by far, the nation's largest diocese -- shortly after Cardinal Roger Mahony reaches the retirement age of 75 in late February. A Missionary of the Holy Spirit elected the community's first US provincial two weeks before his appointment to aid Cardinal Francis George, the presumptive nominee -- a "low-maintenance" cleric who asks to be known as "Bishop Gustavo" -- would be the first religious named a residential archbishop in the States since now-Cardinal Séan O'Malley, a Capuchin Franciscan, was sent to Boston in 2003 in the wake of the abuse scandals' seismic fallout there, and the youngest US prelate to be shouldered with the double-bar cross since Gomez, then an auxiliary of Denver, was sent to his family's hometown to succeed the iconic Archbishop Patrick Flores in late 2004, two days after his 53rd birthday. In the last decade and a half, only two other American prelates have been named to metropolitan posts before turning 55: Timothy Dolan (then 52) to Milwaukee in 2002, and in February 1997, 52 year-old Charles Chaput to Denver. And as rarefied company goes, that troika's tough to top. 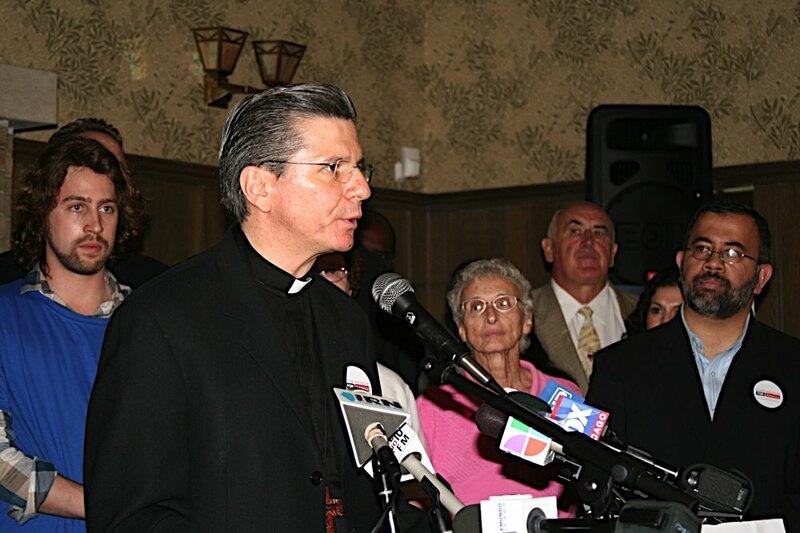 Said to be Chitown's most-requested bishop for Confirmation duty, one Windy City op terms García-Siller "an awesome man," with a simplicity evidenced by his customary wearing of the pectoral cross on a "shoestring," and a conviction hammered home by the use of his well-thumbed personal Bible during his homilies. As another op put it, "he really listens to people"... while, according to another, "He's just so nice"... and, so they say, all wound together with an exceptionally high level of energy. One of 15 children born in Central Mexico's San Luis Potosí, the archbishop-elect entered the Mexico-based Missionaries in 1973. He made his theological studies at LA's seminary, St John's in Camarillo, and served after ordination in a SoCal parish before returning south of the border, spending several years in teaching and formation work. Returning to the States, he led his community's House of Studies at Mount Angel, doing spiritual direction on the side at the Benedictine seminary there. Then, in 1999, he became the US superior of the order, based again in Southern California, where he remained until the call to Chitown came. As ever, more to come... for now, though, two quick-links on the presumptive nominee: a reflection piece he wrote for a vocation magazine, and a New World retrospective on the auxiliary's first five years in the Windy City, in which the prelate recounted the experience of being detained at length by immigration officers on his return from an ordination trip to Mexico despite his status as a naturalized citizen. And lastly, another reminder that -- just as no other outlet could hope to pull the goods from the mine -- these pages keep plugging along solely by means of its readership's support. So whether it's come today or before, to everyone who's lent a hand to that end, as ever, this one's for you and thanks to you... and thanks a million for that. SVILUPPO: As expected, the appointment was formally announced in Rome at noon Thursday; García-Siller will be installed as San Antonio's sixth archbishop on 23 November.